Games marked ** are ideal team activities for your conference, seminar or corporate event. We will do the rest – planning the event for you; supplying skilled trainers and training material to get the outcome you want. “Excellent feedback. People like the fact that because time was limited they had to assimilate quite a lot information quickly and delegate tasks to ensure that they were completed in the allotted time. Elite Training European Limited is a leading UK corporate team building and business games training company. 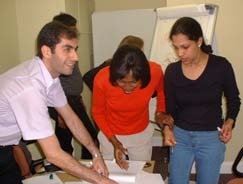 We will be pleased to arrange a business simulation game or team building event anywhere in the UK or Europe.